Every hockey coach worth his salt dreams of one day being behind the bench of an NHL team. Todd Richards is getting that chance on an interim basis with the Columbus Blue Jackets following the dismissal of Scott Arniel on Monday, but he's hardly in an enviable position as the second half of the season gets started. The 45-year-old Richards, who coached the Minnesota Wild the past two seasons, inherits a 30th-place Blue Jackets club that has earned 27 points in 41 games. The Jackets have just 8 regulation/OT victories and are 20 points out of a playoff spot. There are probably only a few things in sports as demoralizing as knowing your season is likely over with still half of it to play. It took 97 points to make the playoffs in the Western Conference last season. For the Blue Jackets to reach that number, they would need to close the season with a 35-6-0 record, or earn 70 points in 41 games. Richards will need to convince everyone -- veterans and rookies -- that they need to work just as hard in this situation and pretend as if they were chasing a playoff spot. GM Scott Howson will have decisions to make over the summer, and how the players respond in tough times will definitely be a factor in what the team looks like in 2012-13. Last week, Nash told reporters that he would be willing to waive his no-trade clause. He's not openly seeking a trade, but the last thing a team wants to hear is that its captain is ready to leave the team if he's asked to do so. Nash has spent all nine of his NHL seasons in Columbus, racking up 273 goals and 517 points in 633 career games. The 27-year-old has only been to the playoffs once his career, posting 1 goal and 2 assists during a four-game sweep at the hands of the Detroit Red Wings in 2009. After being dismissed as Wild coach following two seasons and accepting a job as Scott Arniel's assistant with the Blue Jackets, he's back in charge after Arniel was relieved of his duties Monday. Nash is signed through 2017-18 with a $7.8 million cap hit. Richards needs to make Nash believe there is success coming down the road in Columbus. Richards has a reputation as a player's coach, so maybe he's exactly what Nash needs. The 23-year-old has seen his play erode in the three seasons since winning the Calder Trophy in 2009. Mason hasn't had a goals-against average below 3.03 or a save percentage better than .901 since his breakout season and has posted career-worst stats in those categories (3.46, .882) this season. It's one thing to blame it all on the defense -- after all, blueliner James Wisniewski missed the first eight games of the season due to a suspension -- but backup Curtis Sanford has posted a respectable 2.49 GAA and .914 save percentage in 19 appearances. There may be no bigger challenge for Richards over the rest of the season than resurrecting Mason's fledgling career. The 24-year-old Brassard seemed to be building toward a breakout season. He had 36 points in 79 games two seasons ago and 47 points in 74 games last season. But just like everyone else in the Jackets lineup, he struggled from the get-go and found himself watching from the press box as a healthy scratch at times. It'll be up to Richards to get Brassard playing like he did the past two seasons. The same can be said for Johansen, the fourth pick in the 2010 Entry Draft. The rookie has 7 goals and 7 assists in 35 games, but just 2 goals in his last 23 contests as his ice time has often dwindled below the 10-minute mark. If this is in fact a lost season for the Jackets, Richards would be wise to start thinking about getting Johansen and Brassard feeling good about themselves heading into to 2012-13. When you're a team that's in dead-last in the League, just about everything needs to be improved. But the Blue Jackets rank 30th in the NHL in combined power-play percentage (14.6) and penalty-killing percentage (75.7) at 90.3 percent. 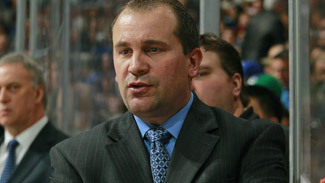 Richards helped the Sharks' power play to finish third in the NHL at 24.2 percent in 2008-09 as an assistant coach. 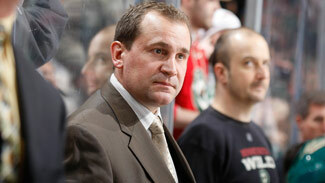 As head coach of the Wild, they didn't finish lower than 13th in the power play during his two seasons. The bigger problem has been the penalty kill. Only the Toronto Maple Leafs have a worse one. And it's not as though the Blue Jackets are taking an egregious amount of penalties -- they've been shorthanded 136 times this season, sixth-fewest in the League. The Blue Jackets haven't been great at even strength, either, but remedying the special teams would mask a lot of their flaws at 5-on-5. For a bevy of reasons, teams that allow the first goal of a game lose more often than they win. But with the Jackets, the problem is magnified. They have allowed the first goal in a game 19 times this season, which isn't a particularly bad number. They've scored the first goal 22 times. But in games in which the Jackets fall behind 1-0, they are 1-16-2, tied for the worst record in the League with the Anaheim Ducks. When a team is this deep in the hole, the big picture can tend to be overwhelming. Maybe if Richards can start small and get the team to think about scoring first and finding success after that, everything can build from there during the second half.